Homeschooling families experience many pressures other families do not have. Typically they live on one income, have long hours, days, and weeks with children who have many needs without much of a break and often without support from friends or family members. Moms, especially, are often isolated and lonely. They feel vulnerable, too, as well as responsible for everything! The real or perceived pressure to perform from both inside and outside homeschooling circles can be overwhelming and the constant temptation to compare yourself with others can cause discouragement and even defeat. Sometimes that pressure comes from one spouse who places unrealistic goals on the other one, causing irritations with each other that lead to arguments and a break down of the oneness marriage is supposed to have. Adversarial views of husband/wife and parent/child relationships set marriages up for failure from the beginning. For example, the common false teaching in evangelical churches that the woman’s curse in Genesis 3 means women will desire to rule over men can be interpreted that if homeschooling moms feel strongly about certain situations with their children, they have a hidden agenda when expressing it to their husbands! Children who express their different opinions are labeled as rebellious. All these things wreck havoc on marriages. 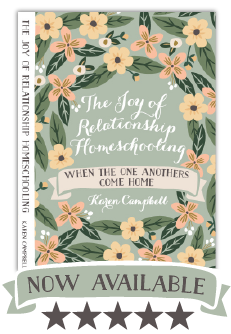 Sometimes homeschooling families think they are immune from relationship struggles (or that they should be) just because they are homeschoolers. So they ignore the problems, sweeping them under a rug. What would their co-op think? What would homeschooling friends in the church think? What would their blog readers think? Also, sometimes people decide to homeschool because they have problems with their children and believe homeschooling will solve those issues. What actually happens is that once you are all together in the same place at the same time, the issues that might have once been hidden all spill over onto the middle of the family room floor and you will be forced to deal with them one way or another. If you don’t want your problems brought to the surface, homeschooling is not for you! Todd mentions seeing couples separate and divorce once their children are homeschooled and gone from home. I have seen this as well and it breaks my heart. Rather than putting energy into their marriages through 20 and 30 years of parenting, they thought they could wait until the children were grown and they were wrong!!! Please don’t let this happen to you! Consider NOW how you can invest in your marriage for the coming golden years!!!! Yes, I agree with this. I live in an expensive area with long commutes, and in so many cases the dads are not involved in homeschooling at all other than bringing in the paycheck to cover the expenses. So the moms struggle through, largely alone and indeed feeling lonely. Not an ideal situation and a set-up for potential trouble IMHO. That said, I always encourage women in these situations to look to the Lord for their encouragement and guidance when their husbands are otherwise occupied and not focused on that. Sometimes it just isn’t going to humanly happen, and you have to make the best of a difficult situation with the Lord’s help. And of course lonely home school mothers should PRAY. Thank you. This was such a balm today. I wonder if there aren’t older folks in churches who might be willing to act as surrogate grandparents occassionly just to give both parents a breather? Just taking a couple of the older kids out for an ice cream cone or visit to a zoo/museum would help. There are certainly some issues to be considered from both sides, i.e. the last thing I want to do is spend a couple of hours with an ill-behaved child who probably needs a good smack on the backside (sorry to anyone who opposes such actions). Granddad, you are correct. In the church we need to watch out for the young couples, especially those who don’t have relatives or friends near by who can give them a break. Your timing is uncanny because my hubby & I have been talking about how we need to prioritize our marriage but also how difficult it is! It’s impossible to schedule date nights or weekends away around other things because there’s too many other things! It’s one of those situations where the urgent is taking precedence over the important but we’re not sure how to go about putting first things first. We’ve talked about doing a marriage encounter weekend–Karen, do you have any thoughts about Marriage Encounter? We did an Engaged Encounter before we got married and it was good but that was ages ago. Funny, I remember reading years ago (I think it was a Mary Pride book?) about how marriage retreats are bogus and every couple she knew that went to marriage retreats was now divorced. That self-sacrifice and proper roles would ensure a good marriage and “time away” was a selfish, worldly line of thinking. This was great ! My children are now grown and have their own children, educating them at home. I am one proud grandma ! Thank you for this YouTube segment about making the husband-wife relationship a priority in homeschooling. Great !